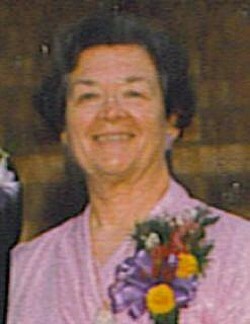 Lillian "Jean" Levsen, 79, of Clarence, died Thursday, July 3, 2008, at Mercy Hospital in Iowa City, Iowa. A celebration of her life was held on Monday, July 7, 2008 at 11:00 a.m. at Lahey Funeral Home in Olin. Burial was in the Olin Cemetery, Olin, Iowa. Friends called from 2 to 6 p.m. Sunday at Lahey Funeral Home in Olin. Lillian Jean Adams was born on February 17, 1929, in rural Keokuk County, Iowa, the daughter of Earl and Norma (Moore) Adams. She married Louis H. Levsen on October 5, 1952 in Olin, Iowa. He died on January 26, 1999. In her earlier years, she taught 6th grade in Olin. She then farmed with her husband and was a bookkeeper for their trucking business. She was one of Jehovah's Witnesses. She enjoyed traveling, reading, and visiting with family and friends. She is survived by her children, Robert (Colette) Levsen of Calamus, Kathryn (James) Baldwin of Concord, California, Laura (Steven) Corbin, of Arlington, Daniel (Mary) Levsen and David (Mary) Levsen, both of Clarence; 13 grandchildren; 11 great-grandchildren; one sister, Irene (Charles) Cassens of Sigourney, and one brother, Kenneth (Colleen) Adams of Olalla, Washington. She was preceded in death by her husband, Louis, her parents and one sister, Dorothy Marie Paxton.